Excellent article in on P2 of today's Daily Mail. 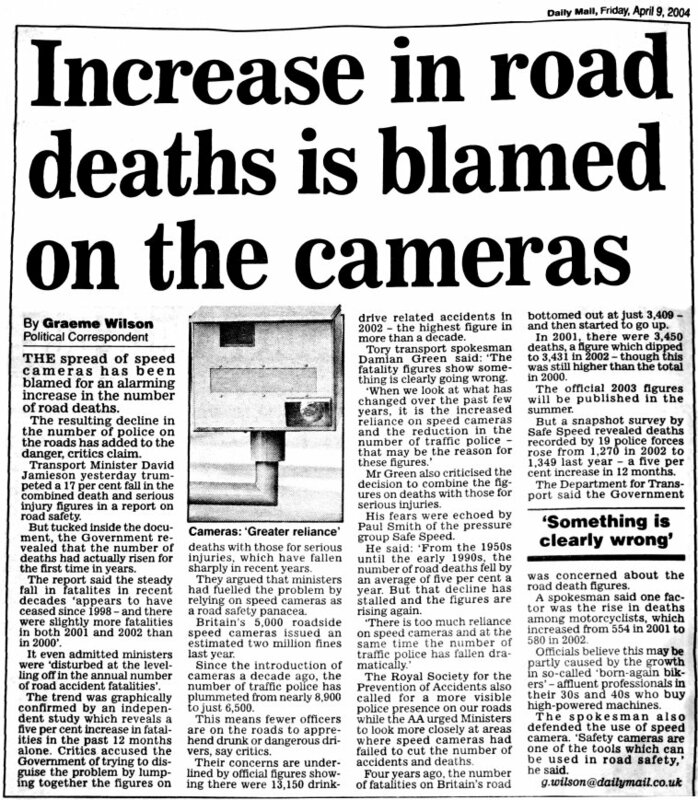 Quotes from David Jamieson about speed cameras casuing the rise in fatalities, and attributes to SS for the figures. Will scan later if required. Yes please! I'd love a scan. The article isn't in the Scottish Edition. Scan provided by LB. Thanks LB! [Of course, I didn't say the number of "road deaths" had declined by 5% per annum since 1950 - I said the fatal accident rate had declined by 5.26% per annum on average between 1950 and 1993. Well, reading that, it's darned inconsiderate of those 30 extra bikers splattering themselves. It seems to have messed the poor old governments statistics up. Keep up the good work Paul, they can only take so much more of this pressure.